Former President Jimmy Carter, founder of the Carter Center and University Distinguished Professor at Emory, will speak to the Ebola Faculty and Community Forum on April 9. His topic is "Ebola, democracy, human rights and public health." The Ebola Faculty and Community Forum runs Jan. 26 through April 16. Approximately 20-25 faculty members representing diverse disciplines will be selected to participate. Applications are due Dec. 19. For more information, please email the Institute for Developing Nations at idn@emory.edu. All schools at Emory are coming together next semester to offer an extensive, multidisciplinary forum to explore the impact of Ebola virus disease on public health, policy, law, ethics, government, development, religion and more. The Ebola Faculty and Community Forum kicks off Jan. 26 and runs through April 16. Speakers include Emory faculty, experts from organizations currently working on Ebola in West Africa, and former President Jimmy Carter, now University Distinguished Professor at Emory and founder of the Carter Center. 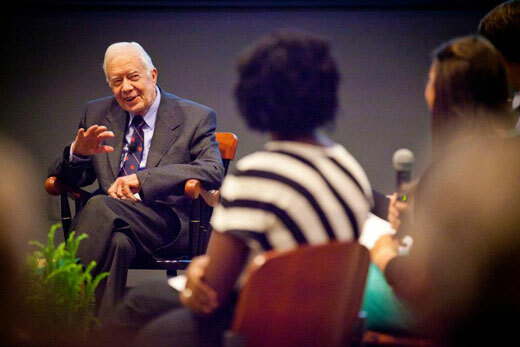 The entire session with President Carter will be open to all who wish to attend. For most other sessions, students, faculty and other members of the Emory community may attend the first hour, while the second part will be reserved for a small group of faculty selected through a competitive application process. Applications are due Dec. 19. "For the first hour, students, faculty and others in the Emory community can take advantage of the tremendous experts we are bringing in, and the second hour will be just faculty so we can have a very intensive conversation with the experts in helping move curriculum and research forward," says Deborah Bruner, Robert W. Woodruff Chair in Nursing. Bruner is co-chairing the forum with Sita Ranshad Nilson, director of Emory's Institute for Developing Nations, and Pamela Scully, director of the Center for Faculty Development and Excellence and professor of African Studies and Women's, Gender and Sexuality Studies. Approximately 20-25 faculty members will be selected to participate in the forum. "We hope to include as much diversity across the university as we can within the limits of how many people we can invite," Bruner adds. The forum is organized by the Institute of African Studies, the Institute for Developing Nations and the Nell Hodgson School of Nursing. All nine schools that make up Emory University have lent their support, Bruner says. In addition to the School of Nursing, they include Emory College of Arts and Sciences, Oxford College, Candler School of Theology, Laney Graduate School, Goizueta Business School, the School of Law, the School of Medicine, and the Rollins School of Public Health. The current schedule for the forum appears below. Locations will be announced closer to the events and times may be subject to change. Attendance for the community portion will be first-come, first-served, and Bruner notes that since the events are expected to be popular, attendees are encouraged to arrive early. Organizers also plan to record video of the sessions so that others can watch if they can't attend. • Ebola, "a neoliberal disease?"